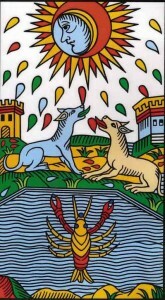 The Moon is the eighteenth Major Arcana of the Tarot. 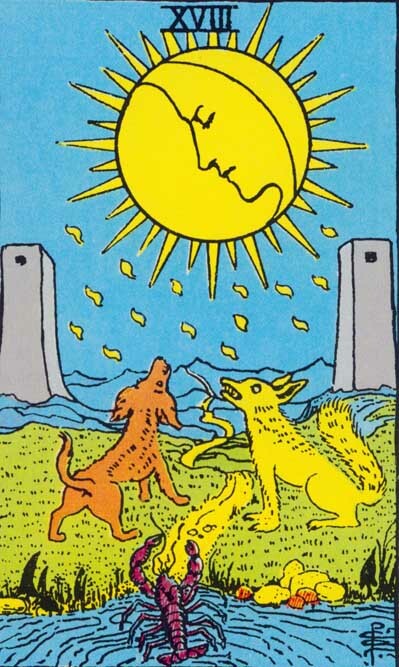 It is one of the three consecutive trumps representing the luminaries: The Star (17th), The Moon (18th) and the Sun (19th). According to A. E. Waite, the divinatory meaning of the Star is expressed by the following words: „hidden enemies, danger, calumny, darkness, terror, deception, occult forces, error“. Reversed, the Star can signify, according to the same author: „instability, inconstancy, silence, lesser degrees of deception and error “. 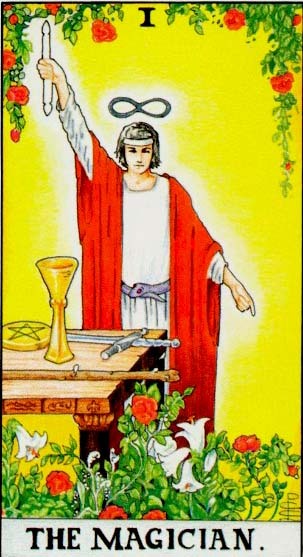 In the chapter „The Doctrine behind the Veil“, Waite is very clear, affirming that „the card represents life of the imagination apart from life of the spirit“. 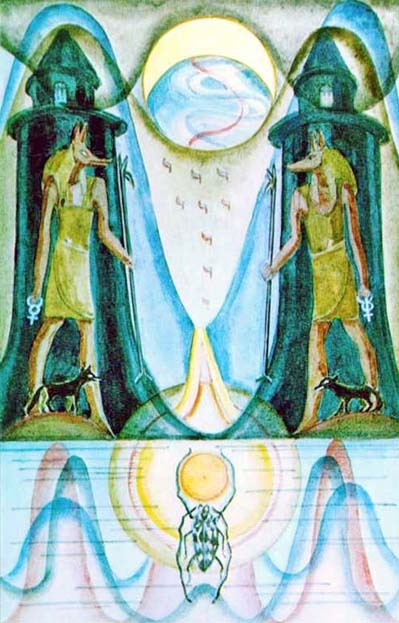 He speaks, also, about „another form of symbolism“: „the intellectual light is a reflection and beyond it is the unknown mystery which it cannot shew forth. 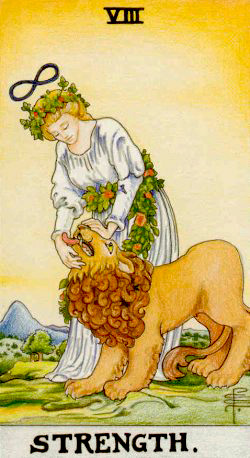 It illuminates our animal nature, types of which are represented below–the dog, the wolf and that which comes up out of the deeps, the nameless and hideous tendency which is lower than the savage beast. It strives to attain manifestation, symbolized by crawling from the abyss of water to the land, but as a rule it sinks back whence it came. The face of the mind directs a calm gaze upon the unrest below; the dew of thought falls; the message is: Peace, be still; and it may be that there shall come a calm upon the animal nature, while the abyss beneath shall cease from giving up a form“. „A desolate plain stretched before me. A full moon looked down as if in contemplative hesitation. Under her wavering light the shadows lived their own peculiar life. On the horizon I saw blue hills, and over them wound a path which stretched between two grey towers far away into the distance. On either side the path a wolf and dog sat and howled at the moon. I remembered that dogs believe in thieves and ghosts. A large black crab crawled out of the rivulet into the sands. A heavy, cold dew was falling. Dread fell upon me. I sensed the presence of a mysterious world, a world of hostile spirits, of corpses rising from graves, of wailing ghosts. In this pale moonlight I seemed to feel the presence of apparitions; someone watched me from behind the towers,–and I knew it was dangerous to look back“. The author offers us the following explanations, regarding the sign of Pisces: „Pisces is the last of the Signs; it represents the last stage of winter. 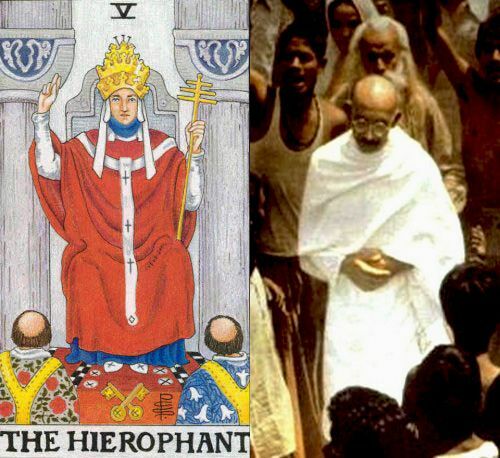 It might be called the Gateway of Resurrection (the letter Qoph means the back of the head, and is connected with the potencies of the cerebellum). In the system of the old Aeon, the resurrection of the Sun was not only from winter, but from night; and this card represents midnight“. And, about the Moon, Crowley affirms: „The Moon, partaking as she does of the highest and the lowest, and filling all the space between, is the most universal of the Planets. In her higher aspect, she occupies the place of the Link between the human and divine, as shown in Atu II. In this Trump, her lowest avatar, she joins the earthy sphere of Netzach with Malkuth, the culmination in matter of all superior forms. This is the waning moon, the moon of witchcraft and abominable deeds. She is the poisoned darkness which is the condition of the rebirth of light“. Here are his final explanations and conclusions: „This is the threshold of life; this is the threshold of death. All is doubtful, all is mysterious, all is intoxicating. Not the benign, solar intoxication of Dionysus, but the dreadful madness of pernicious drugs; this is a drunkenness of sense, after the mind has been abolished by the venom of this Moon. This is that which is written of Abraham in the Book of the Beginning: “An horror of great darkness came upon him.” One is reminded of the mental echo of subconscious realization, of that supreme iniquity which mystics have constantly celebrated in their accounts of the Dark Night of the Soul. But the best men, the true men, do not consider the matter in such terms at all. Whatever horrors may afflict the soul, whatever abominations may excite the loathing of the heart, whatever terrors may assail the mind, the answer is the same at every stage: «How splendid is the Adventure!»“. 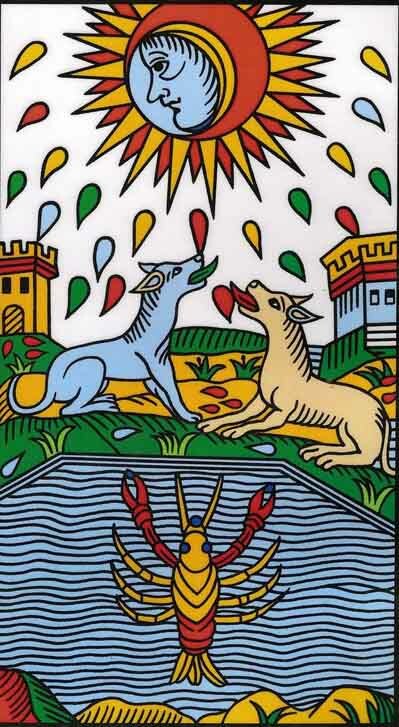 For Papus, the eighteenth card of the tarot is strongly associated with the ideas of materialisation and involution, explained as the descent of the Spirit into Matter: „the material world is the last point which the spirit can reach, it can descend no lower“. End of divine Materialization – final point of involution – CHAOS. End of the Materialization of man – THE MATERIAL BODY AND ITS PASSIONS. End of physical Materialization – MATTER. Share the post "The Moon – Major Arcana Tarot Card Meaning, according to Waite, Ouspensky, Crowley and Papus"